So easy for Bennett. It appears he was exaggerating yesterday when he said he had no shape. Very disappointed that Poestlberger got caught. Also a bit sorry for Ewan who just has nothing going right for him at the moment. Super strong team performance from Bora there. Grosschartner looking good. BTW, loved all the men in yellow at the entrance to the finale climb; wouldn't risk riders getting confused about the route. Yes, Evenepoel, what an idiot. Testing to see what's possible and what's not. Moron. Because obviously nobody told him he isn't riding in the juniors anymore. He should learn from the other GC riders. Wait for the final 100 meters to attack. And if possible don't attack at all. Großschartner looks good for the GC. Logic-is-your-friend wrote: Yes, Evenepoel, what an idiot. Testing to see what's possible and what's not. Moron. Because obviously nobody told him he isn't riding in the juniors anymore. He should learn from the other GC riders. Wait for the final 100 meters to attack. And if possible don't attack at all. That's fair enough, etc, etc. But why did he end up on the front chasing Pöstlberger? Because he's a 19 year old kid that is testing his limits. I'd rather see him try and fail, than assume whatever he's being told is automatically true for him. He's 19, it's only the Tour of Turkey. Let him try, even if it means crash and burn. Last edited by Logic-is-your-friend on 17 Apr 2019 21:06, edited 1 time in total. Imagine if Bora wins every stage (5x Bennett + 1x Großschartner) + the final GC. Not even so unlikely to happen. Again, a stage with two halves. First little lumpy, then a descent and the final 35 km to the finish flat. 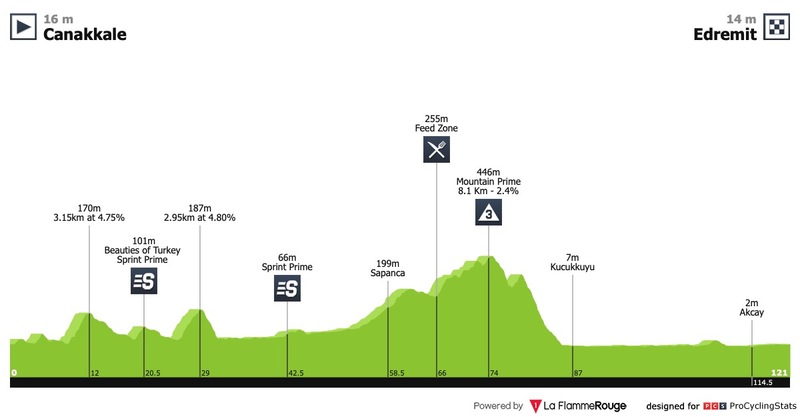 Only 122 km though so ... either Bennett wins again or we get some echelons along the coast. 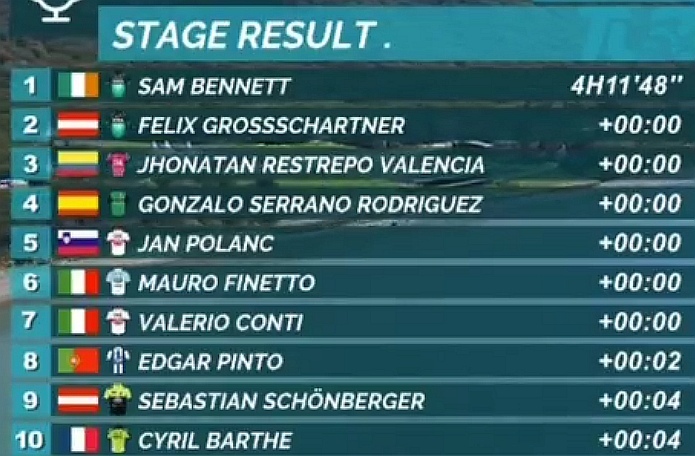 Bennett is obviously the favourite but there are two other properly fast sprinters in the race. Ewan took a bit of a knock today, but Jakobsen didn’t and he has most of the DCQ first choice train working for him. I think he’ll take at least one from Bennett, so why not tomorrow? DCQ have quite a lot of experience in combating Bennett’s preference for taking a ride on their train. The pain in the wrist of @CalebEwan seems to have lessened, so he won't need to go to the hospital. Hope he's fit for a sprint! Weather forecast says breezy and from NE so a possibility of crosswinds on the run-in. Regarding Evenepoel's attempt yesterday. Since there was no opportunity to do an actual recon, he had only the roadbook to go by. On paper it seemed tougher than in reality. The attempt was planned. 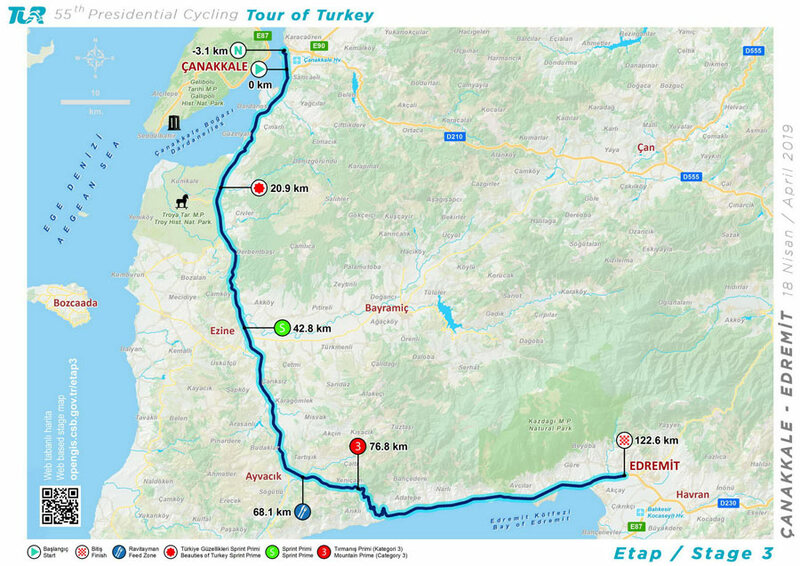 Stage 3 under way - 6 guys out front in the break - Langelotti (Burgos), Berrade (Euskadi), Marengo (Neri), De Vylder (Vlaanderen-Baloise), Örken and Samli (Turkey) - 2 mins lead after 8km. Ahmet Örken sits up and awaits the peloton after having helped Feritcan Samli in the Beauties of Turkey sprint. No excueses today for sprinters - flat, straight, little wind. Let the fastest man win! I haven't read that. He probably still doesn't know who is who in the peloton, lol.